In more bad news for the Baath regime of Bashar al-Assad in Syria, Daesh (ISIS, ISIL) fighters have taken the town of Al Qariyatain southeast of Homs and are advancing west on the nearby towns of Mheen and Sadad. These central small towns are Sunni-majority, but have significant Christian populations. Daesh considers Christians collaborators with the Baathist government (most Christians in Syria, about 5 percent of the population, are neutral but many fear radical Muslims and so tilt toward the Baath regime, which is secular and typically has left Christians alone. The Daesh advances into the Homs area come as Hizbullah is tied down to the west, in Zabadani and the Qalamoun mountains (southwest of Asal al-Ward on the map), trying to expel Daesh and al-Qaeda and protect the northwest flank of Damascus as well as protecting Lebanese Shiites and Christians from Daesh infiltration. But as Hizbullah has been concentrating on these western areas of Syria, Daesh is taking advantage of the vacuum to the east. Qariyatain had a population before the war of 18,000, about 2000 of them Christian. The Christian population has declined to only about 160, some of them new refugees from Aleppo. Some 60 Christians are alleged to have been taken away by Daesh. It is never a good sign when Daesh takes you away. Daesh fighters maintained that they had good intelligence on the Christians in Qariyatain and had a list of collaborators with the al-Assad regime. The advance of the terrorist organization on other small towns in the area with Christian populations will provoke another wave of forced migration. Daesh rules by spreading fear and terror in the local population, with mass executions and beheadings. Many Syrian Christians, who may have been over 1 million of Syria’s 22 million people, have fled to Lebanon or Turkey. Dr. Michel Jalakh, head of the Middle East Council of Churches (MECC) (a subsidiary of the World Council of Churches) called on the international community to determine the whereabouts and well-being of the 230 persons, including 60-70 Christians, who had been abducted by Daesh. Father Jalakh deplored this new attack on Christians only 6 months after they were targeted, and 150 were abducted, in Assyrian villages near Hasaka in the northeast of Syria. Pope Francis just last week warned against ethnic cleansing and even genocide against Middle Eastern Christians. Strategically, Daesh is likely trying to cut the highway access between Damascus and Homs, which links the capital to the northeast port of Latakia. 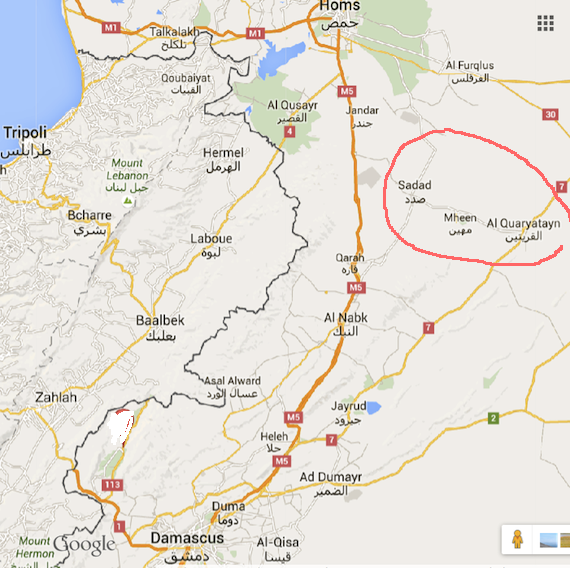 Attempts by rebels to take Homs and so isolate Damascus were halted in 2013 by the intervention of Hizbullah, the Shiite Lebanese party-militia, which came in on the side of al-Assad’s forces at Qusayr southwest of Homs. Since the Shiite-dominated Bekaa valley of Lebanon lies just west of Qusayr, the fall of that town would have threatened Hizbullah’s constituencies.